Earlier in the year Aardman Animations released The Pirates! In An Adventure With Scientists at the cinema. In honour of it’s DVD release Aardman have produced a short animation DVD in conjunction with Tesco stores called ‘So You Want To Be A Pirate!’ I was lucky enough to be sent a review copy to watch with the kids. First of all I haven’t actually seen the film that this DVD is promoting! Like most films I fully intended to take the children along to the cinema, but family life being what it is we never got around to it. This is where DVDs come in so handy, I can always find a moment at home to sit down with the kids. The children were therefore very excited to watch this short animation, they knew it was not the film, but as my boys are currently somewhat pirate potty they were very excited none the less. Like many people I grew up with the Wallace & Gromit films made by Aardman. The whole family would sit down together and even the adults could appreciate not only the skillful stop motion animation but also the wonderfully British humour. I even had a budgie named after Gromit, we were true fans! This undoubtedly means that I have high expectations when it comes to their new releases. I am therefore very pleased to report that this DVD lived up to those expectations in everyway. As usual there was the smooth animation and wonderfully wide grins that are essential to an Aardman flick. There was also a good deal of humour that had me chuckling away as much (if not more!) than the kids. Everything I expect from an Aardman film, from the jokes, to the styling, to the cute animals, every element was here. 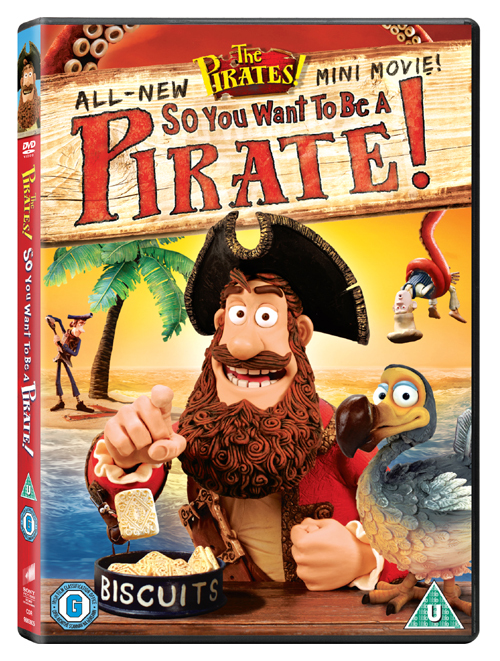 The DVD also features extras including: How To Animate Your Pirate, How To Draw A Pirate and How To Talk Like A Pirate!. Plus there’s extra content accessible by popping the DVD into your computer including games, colouring pages, recipes and more! The DVD itself only runs for 17minutes, but I find that perfect for short attention spans and at an RRP of just £5 you can’t really complain. All in all we thoroughly enjoyed this DVD and have watched it many times already. Not really, there were certainly no complaints from the kids. Would I recommend this item?